But I understand this sentiment better now, because during the past year I have followed the TV series “Breaking Bad” to study the character development. I started watching this award-winning series during the summer and thanks to Netflix I caught up on all the past episodes in time to watch the season finale last month. For those of you still on the Breaking-Bad-dom journey, there are no spoilers in this post. Television writers — especially on the premium cable channels — are creating more edgy protagonists. These are leading characters we can’t really admire but who are more-dimensional than the heroes of decades ago. We always knew Marshall Dillon, Perry Mason, Magnum and even Maverick would end up doing the right thing and by the end of the hour, evil would be conquered once again. The imperfect — or at least very complex — protagonist emerged a few years ago in Tony Soprano and Jack Bauer. I never watched “The Sopranos”, but I rented the first season of “24” and after those 16 episodes, I was a nervous wreck. Then, a friend at work said would enjoy “Breaking Bad” and I decided to give it a shot. Over the next couple of weeks, with my 24-year-old son, I watched the first season. Walter White (Bryan Cranston) plays a High School Science teacher who is diagnosed with lung cancer. He needs money for his treatment. I don’t remember the amount — $400,000 say. That’s all he needs. 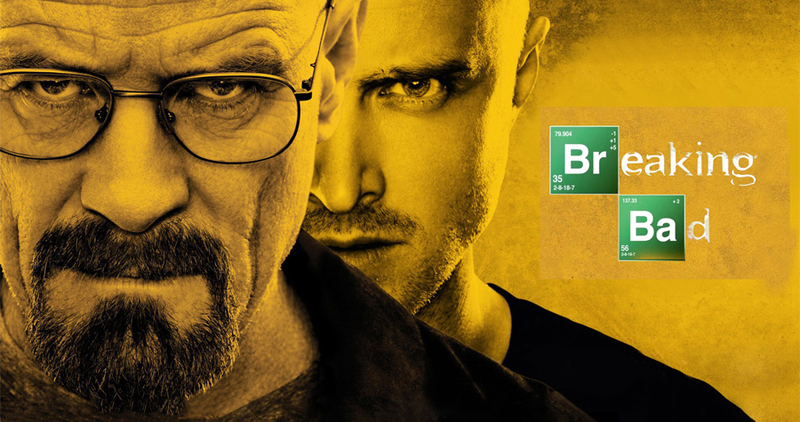 He hooks up with a former student, Jesse Pinkman (Aaron Paul) who cooks and sells meth from time to time. Walt, being a scientist, decides he can cook pure meth with no danger of contamination that often proves fatal to the users. Therefore, he won’t really be hurting anyone and he will do it only until he has the money he needs. At first the close scrapes they have are rather amusing. No one is being hurt. They are simply making a product that is in current demand. If they don’t cook it someone else will. When their meth becomes known as a very pure product, others want in on the business. Things get more complicated and finally someone has to be killed. Did you catch the passive phrase there? No one takes personal responsibility for another person’s death — it’s just necessary to the operation. I saw the series finale a few weeks ago and I’m satisfied with how it had to end. I can appreciate the writers for giving us a study of what a character can become depending on the choices he makes and the rationale he uses for those choices. I just watched all 5 seasons in the past three or four weeks. I was very impressed with all of the characters. They were definitely multidimensional characters. I really enjoyed the show. My friends, husband, and I are still analyzing it. Let me know if you would like to contribute to our theories sometime. My husband and I just started watching Breaking Bad after having withdrawals from Mad Men and Downton Abbey. We are only into season two but I am hooked. I love the show. Very edgy. Kayla, that sounds like fun! After each episode, Phillip and I would discuss what the character’s did and their possible motivations. My son told me about it during the third season, so I bought the first two so I could get up to speed. Got hooked immediately! I love how it began as a dark comedy(at least, that was MY take, first season, because of all the bungling) but each season got stronger and more serious. I haven’t watched the last, but hate for it to end. Did you read the super fan letter that Brian Cranston got from Anthony Hopkins? Worth ANY award! AND, Dot, your analysis is SUPER! Excellent analysis Dot! I think…I’m still somewhere in Season Two. But, since you are done I strongly urge you to move on to another series with complex characters, intricate plotlines, and a murky sense of the interactive relationship between good and evil. In fact, one of my favorite aspects of Sons of Anarchy (now showing on a Netflix subscription near you for catch-up purposes-and FX once you are current) is that the only people worse than the bad guys in the series…are the good guys. I haven’t seen Breaking Bad, but it must be all you and the others say about it because I keep hearing about the final episode. I agree that audiences want more realistic characters than we used to settle for because that’s how life is. Sounds like an interesting character study. Maybe Terry and I will check it via Netflix.